Today, during RIM's keynote session at BlackBerry World there were two critical areas where I felt RIM did an amazing job. These two changes could mark an important turnaround for the company. So let's go through them. First up - let's talk about the product. We're working on some more detailed editorials on the features RIM demonstrated. But suffice to say BlackBerry 10 is a stunning change for this company. The new virtual keyboard, the "flow" of the user interface, and even the camera (with time-machine-like capability) were hugely innovative. Coming from a company that has been accused of lacking innovation for years, these demos were greeted by thunderous applause. RIM has gone back to being cool. Second, and less obvious, is the way the company presented its message. And this is what I really want to talk about here. I was impressed with how well Thorsten Heins delivered a compelling and understandable message about what RIM represents. 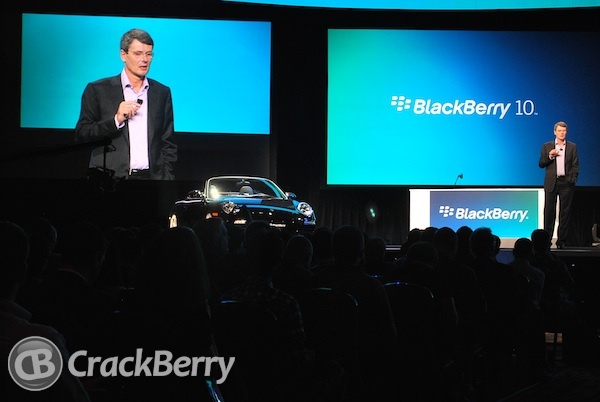 In a nutshell, "BlackBerry is all about success", Thorsten said. He positioned BlackBerry as a brand for people who want to get stuff done and be successful. It's about getting something done on your phone quickly, without hassle. This is such a better way to position the BlackBerry brand versus focusing on features like some of the past advertising campaigns (remember the "Flash loving" Playbook?) Nobody cares to see you run commercials about your dual core processor or multi-threaded OS. But telling us that BlackBerry is all about success? That resonates. I also feel like Thorsten came across as genuinely confident, well-spoken, and excited about his company' s direction. I'm sure he spent hours and hours rehearsing for today's event, and it showed. Everyone else who was part of the keynote did an excellent job, too. I would have liked to see more demos, but that's a minor point. We heard clear messaging from Robin Bienfait (CIO), Al Panezic (VP on Enterprise) and Marty Mallick (Senior biz dev director). A special shout out to head of software portfolio, Vivek Bhardwaj is also well deserved. He ran the demos alongside Thorsten on stage. Awesome delivery guys. For years, RIM has been a company with absolutely no marketing skill. A big part of that problem, perhaps, was directly coming from the top of the company. There was no clear message about what RIM represents. I feel like Thorsten took control of that problem and solved it. Now it's time to see RIM drive this new marketing message into the enterprise and consumer markets with social media, advertising, and actual product deliveries.